Use this WH5 universal wall hanger for 5 lb. CO2 fire extinguishers that have a loop hanger on the head of the extinguisher. 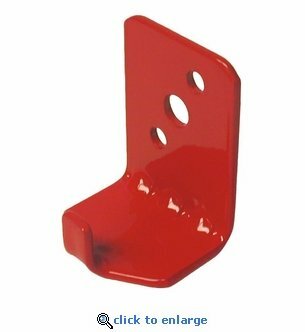 Other extinguishers this wall hook bracket can hold includes 6 - 10 lb Dry Chemical and 9 lb Halon extinguishers with a hanger loop on the extinguisher head. Mounting hardware required: #6 or #8 screws with appropriate wall anchors (not included). Fits these Amerex Models: 322, 369, 461, 456, 462, and 457 made in 2008 and later. Older Amerex models should use fork style bracket 5525A instead.